With the new book Evo’s Bolivia: Continuity and Change, authors Linda Farthing and Benjamin Kohl achieve an admirable balance of providing an excellent entry point for those with little background in Bolivia as well as key insights for scholars and activists with a long history in the country. 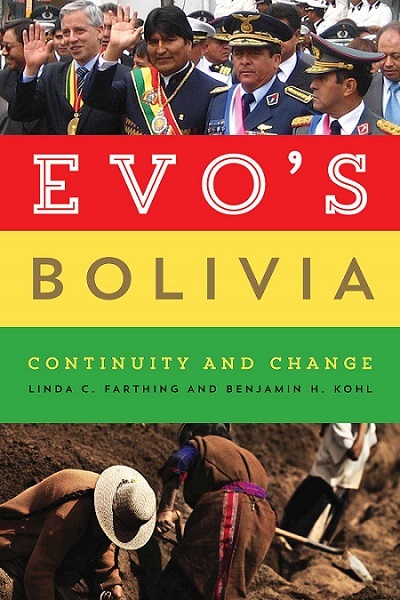 Reviewed: Evo’s Bolivia: Continuity and Change, by Linda C. Farthing and Benjamin H. Kohl. (Austin: University of Texas Press, 2014). Linda Farthing and Benjamin Kohl recount in their new book on contemporary Bolivia the story of a rural community that voted almost in its entirety for president Evo Morales but complained that subsequently nothing had changed. Yes, a community member acknowledged, they now had a road, a clinic, a school, electricity, and cell phone coverage. But visa restrictions meant that fewer tourists arrived than before Morales took office, which reduced their income from the sale of weavings. This story is representative of a theme of promises and limitations of revolutionary change that runs through the aptly named book Evo’s Bolivia: Continuity and Change. While some scholars such as Jeffery Webber are highly critical of the shortcomings of the Morales administration and others such as Federico Fuentes ardently defend the government, Farthing and Kohl attempt to balance the gains of the Morales administration with the restrictions of making the necessary profound changes to society. They conclude that over the short term realizing the long-term objections of radicalized social movements remains difficult. Nevertheless, they argue, “the chaotic and often contradictory Morales administration” is definitely preferable to “a return to business as usual under global neoliberalism” (161). Farthing and Kohl do not hesitate to acknowledge the achievements of the Morales administration, nor do they shy away from criticizing the failures of the government. A list of the major achievements indeed are impressive: a new constitution, a significant redistribution of land, poverty reduction, education reform, literacy campaigns, expansion of medical services, industrialization, and environmental legislation. At the same time, government failures have led to growing critical voices on the left complaining of a concentration of power in the hands of a few leaders, corruption, and a failure to break from an extractive economy. 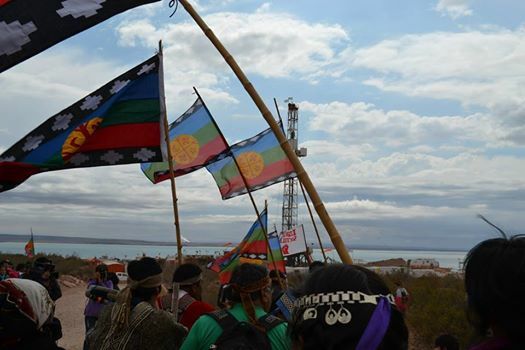 The issue of continuing reliance on the logic of an extractive economy carries a particular political currency in Bolivia. In his classic work Open Veins of Latin America, Uruguayan journalist Eduardo Galeano employs the image of the exploitation of the incredibly rich silver veins in Potosí draining the wealth out of the country. The result is the familiar resource curse, with a colony such as Bolivia with the richest natural resources in the world becoming the poorest South American country. Capitalism excels at under-developing peripheral economies. Farthing and Kohl argue, as many others have, that it simply is not possible to break from “five hundred years of an extraction-based economy in under a decade” (159). 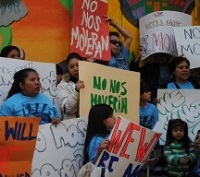 While everyone acknowledges that profound transformations are exceedingly difficult, labor leaders such as the late activist Domitila Barrios de Chungara and Aymara leaders such as Felipe Quispe question whether the government is even attempting to engage in fundamental structural changes that would move the country away from the logic of neoliberalism. The face of the government has changed, these critics charge, but the behavior and mechanisms of managing the state has remained the same. What a post-extractive government would look like remains a highly contentious issue. 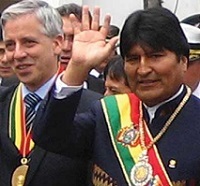 Bolivia’s Foreign Minister David Choquehuanca has talked about how a capitalist economy is based on “living well” through material accumulation, but counterpoised to this is an Indigenous alternative of “living better” that responds to a different logic. His proposal has led to much talk in recent years of the “buen vivir” or “vivir bien,” with its linguistic counterparts “suma qamaña” in Aymara and “sumaj kausay” in Quechua. Farthing and Kohl devote an entire chapter to the topic of buen vivir, but what this cosmological shift would look like remains unclear. Farthing and Kohl frame the issue in terms of wealth transfers and increased access to education and health. Some people talk about the buen vivir in terms not unlike standard discussions of sustainable development, and others treat it as a synonym for socialism. Some Indigenous critics charge that both capitalism and socialism are predicated on the values of modernization that require the exhaustion of natural resources. In Bolivia, these debates most visibly came to the surface with the government proposal to build a road through the Isiboro Sécure National Park and Indigenous Territory (TIPNIS). What difference does it make, these critics charge, to have a socialist government if the end result is the same: the destruction of the planet in pursuit of economic growth. Other than for some fringe elements and intellectuals sitting comfortably in their ivory towers, few people want to return to a primitive existence or voluntarily give up the benefits of modernity. Happiness in and of itself is not a sufficient replacement for material comforts. Slogans and vague ideas of decolonization are no replacement for the implementation of substantive policies that address these pressing issues. How to engage in a fundamental transformation of an economy without triggering disruptions and conservative reactions that would lead to a collapse of the entire political project is a conundrum that has long plagued the left. Farthing and Kohl depict the Morales administration as a transitional stage that will lead to more profound changes. Even so, disillusionment among Morales’ social movement base with his political project continues to grow even as his personal popularity remains very high. In Evo’s Bolivia, Farthing and Kohl engage in a probing analysis of these pressing issues that are critical to the survival of our planet. The result is a successful, thoughtful, and compelling book that is written in a fluid and accessible style. The narrative is interspersed with interviews the authors conducted across Bolivia. As a result, the book achieves an admirable balance of providing an excellent entry point for those with little background in Bolivia as well as key insights for scholars and activists with a long history in the country. Marc Becker teaches Latin American history at Truman State University. He is the author of Pachakutik: Indigenous movements and electoral politics in Ecuador (Rowman & Littlefield Publishers, 2011) and Indians and Leftists in the Making of Ecuador’s Modern Indigenous Movements (Duke, 2008); co-editor with Kim Clark of Highland Indians and the State in Modern Ecuador (University of Pittsburgh Press, 2007); and editor and translator with Harry Vanden of José Carlos Mariátegui: An Anthology (New York: Monthly Review Press, 2011).